We all waited for this fantastic evening, and what a game it was. Barcelona took on the lead very early after a pretty shaky period for Juventus, thanks to the man of the match, Iniesta who found Rakitic with a cut-back pass into the penalty-spot. Juventus did eventually shake things up and did also find the equalizer to keep the final dramatic enough, but with the attacking-trio of Barcelona, Juventus proved to be too vulnerable to direct counter-attacks. 6. Pogba; 23. Vidal; 10. Tevez; 9. Morata. Playing a 4-4-2 in defense, Juventus had all parts of the team deep in the defensive phase, to try and minimize the spaces for Barcelona to penetrate. Playing deep, Barcelona were able to play the ball to one flank and then switch from one side to the other side, mainly trying to stretch out the Juve defense. 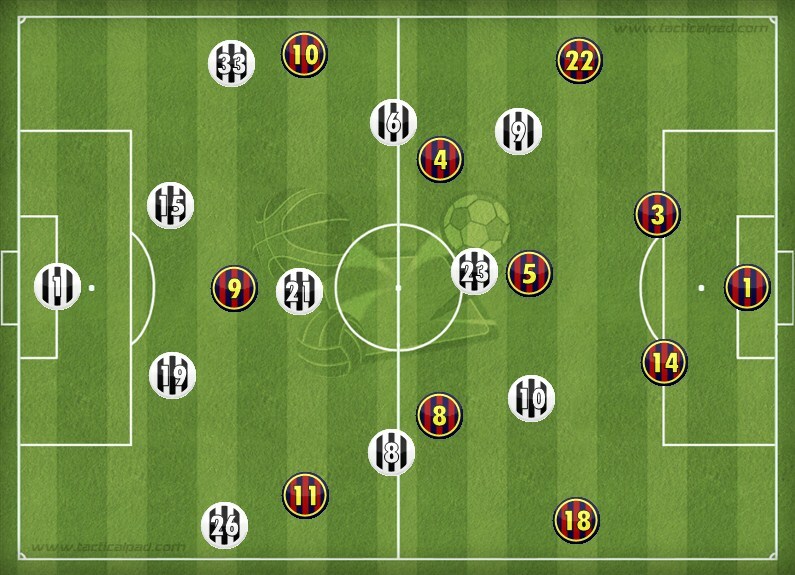 As Juventus had their main focus on keeping the team compact and forcing the opponent out wide, Juve in the wide areas did try to outnumber Barcelona, where for-example Evra was seen leaving his position (left Juventus with a 3-line defense) to join the central-midfielder in the pressing near the touchline. Another detail which should have helped a lot more was to try and increase the defensive responsibilities of Tevez and Morata, who were defending very passively throughout the entire game. I personally would have liked to have seen Tevez or Morata man-marking Busquets to prevent the link-up passes through Busquets. The unsuccessful detail in these pressing occasions from the Italian side, was that Juve gave Barcelona too much time on the ball, which Barcelona were able to exploit, and attack Juventus with diagonal balls to try and stretch out the defense. Another detail which was later readjusted was the position of Vidal who was more often seen defending between the midfield/attacking lines, to prevent Messi or Busquets from penetrating there, but this only caused problems for Juventus as it left massive gaps for Marchisio and Pogba in the wide areas who were then forced to cover lot of area. This was eventually readjusted by Juventus and they were more often seen defending with a flat 4-man midfield with Vidal dropping down. This also made it harder for Barcelona to play through. 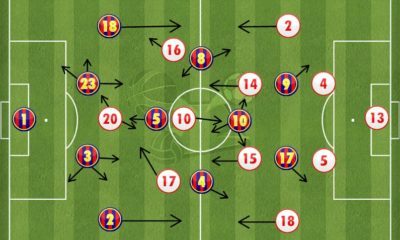 Barcelona plays a very rotational system of positions which I personally believe is the future of football. For example Rakitic occupies the zone/position that Messi has left, when Messi is in a more central position, where Messi can use his left foot to try and threaten Juventus. This is a style which not many teams have been able to defend against as it causes disturbance and forces the opposition to change positions within the team in specific moments as in this situation. 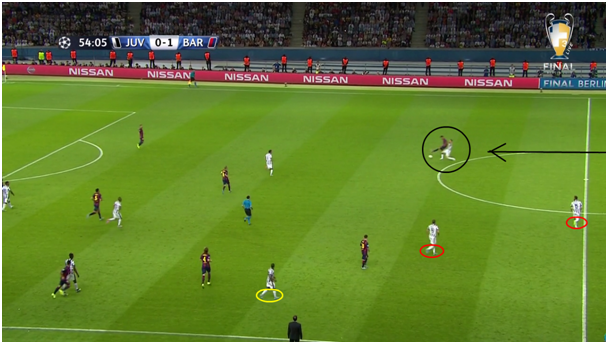 Because of the very centrally focused Juventus, Barca aimed to try and stretch out Juventus with a direct approach. In this situation Barca has already achieved that by forcing Evra out of his position. Evra having his focus on (marking) Messi, leaves a gap behind himself, that Rakitic exploits/penetrates, which forces Bonucci to cover-up for Evra. Now basically Juventus are playing with a 3-man defense, with lots of spaces in the channels and between the defensive lines of Juve. With no real pressure (Tevez in this situation is way too passive in his approach towards Messi) on Messi, he is able to play the ball and switch side to Alba (the full-backs of Barcelona were always seen penetrating the flanks to keep the width). Here we see a 3v3 situation inside the penalty-box of Juventus. These situations occur due to the unsuccessful try from Juventus to prevent the long-ball of Messi and he was often seen playing this diagonal ball. 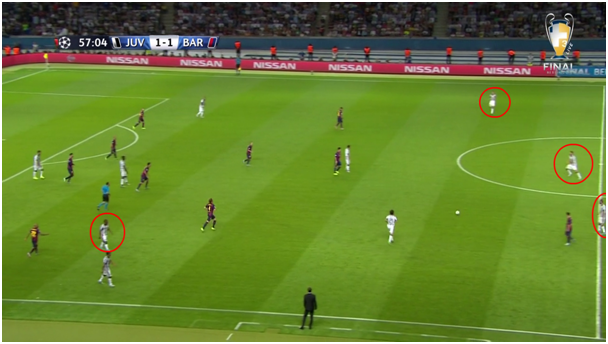 Alba positioned himself horizontally to keep the width of the pitch/team in attack. The ball reaches Alba who passes the ball to Neymar now inside the penalty box. Now thanks to the long-ball of Messi, the Juventus midfield are a bit late in their switch from one side to the other in defense as you can notice that Barzagli is now seen/forced to press Neymar, which makes Barzagli leave his central-defending position which eventually opens up space for Barcelona to exploit. The one to put the pressure on Neymar to prevent an eventual 2v1 situation for Lichtsteiner should be the nearest central-midfielder (Marchisio), who is too late into this situation. Barzagli has left space for Barcelona to exploit and as nobody in Juventus is seen covering up the space, Iniesta instead starts his run to exploit it. Notice how Marchisio is too focused with his sight on the ball, and should instead position himself near Bonucci to leave Pirlo to cover up the space which Marchisio is in or vice-versa. Now with one pass Barca is able to play through Pirlo, Marchiso and Vidal thanks to the Neymar pass and the run of Iniesta. 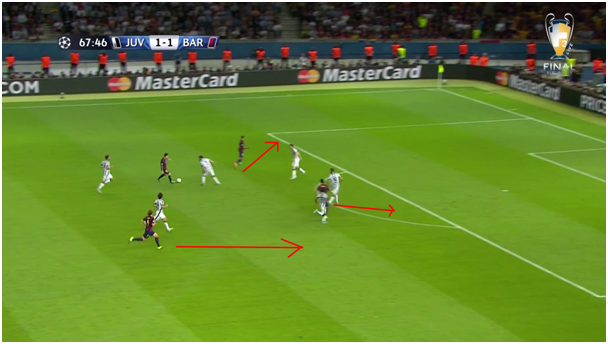 4 players of Juventus have now been taken out and Iniesta is all free in a 3v2 situation. Bonucci is forced to try and prevent Iniesta which eventually sees Rakitic all free due to the bad positional play from Juventus in this situation. Rakitic scored a simple goal at this point. As in Madrid, Juventus were able to find the equalizer by changing their approach in the 2nd half of the game. The main change was to have Evra and Lichtsteiner penetrate the flanks much more and attack more through the wide areas, to help Juventus keep full width of the pitch in their build-ups and have more players occupying attacking-zones of the pitch. This did eventually lead to Barcelona dropping deeper and deeper which also let Juventus find their way back into the game. 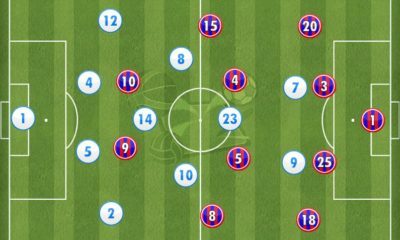 Having the full-backs pushing-up towards the field, gave the 3 central midfielders more space to penetrate in the central areas as especially Pirlo and Pogba were seen in much more attacking zones in the 2nd half. Allegri’s hand was forced into this more risky form of defending to try and find the equaliser. It eventually led to a goal for Juventus, but you should focus more on how attack minded the Juventus full-backsare. Evra (yellow-marked) is keeping the width and Lichtsteiner has followed Neymar to put pressure on Neymar from behind. Notice also the 2 defenders of Juventus near the middle of the pitch (red-marked) to show you how Juventus have moved the different parts of the team to a more attacking-minded zone, with a very high-defensive line. Here we see another situation of when Juventus has the full-backs keeping the width with the rest of the team pushing-up the field leaving Barcelona to drop deeper down their own half-pitch. What Juventus also did well was rotate between the different positions, occupying different spaces with different players. For example, we could at first see Morata in wide areas and later penetrating centrally, or as in this situation (above) Tevez and Vidal playing/penetrating as a winger. Pirlo did though keep his central position to provide balance in their attempt to switch sides, and also to play the terrific passes he often does. Again a situation where Juventus has their full-backs: Evra and Lichtsteiner positioned more offensively to keep the full width of the team/pitch in attack/build-ups of Juventus, to try and create spaces for the remaining attacking/creative players of Juve. These tactical adjustments were very risky, as it created lots of spaces for Barcelona to exploit in eventual transitions, and that is exactly what decided the outcome of the game. variations that create opportunities for Barcelona to take advantage and maximize the full potential of all their players. Enrique has developed a mix of Heynckes’ Bayern Munich side with fast transitions from defense to attack and a Guardiola way of controlling the game with the ball in possession, making Barcelona un-expected and hard to defend against. The goals to secure the treble for Barcelona were the two last goals of the game. 2 goals that were scored in almost the exact same way: By exploiting Juventus whenever they were at their most vulnerable (right after the moment of losing the ball). 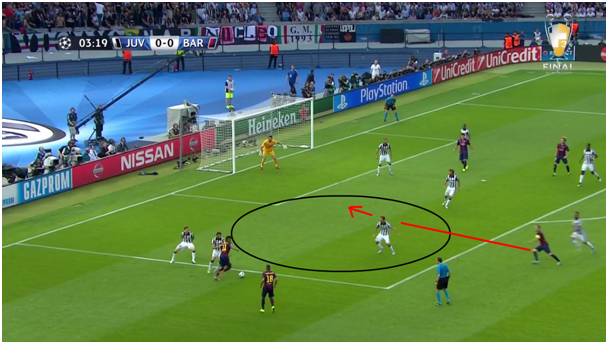 This game Barcelona showed how efficient and quick they are to exploit counter attacking opportunities. Due to many Juventus players penetrating in attacking-positions (opposition’s half) and the defending line high-positioned, Barcelona had opportunities to counter-attack whenever they recovered the ball. Barcelona wins the ball back from Juventus and immediately starts the process of a counter-attack due to the now unorganized Juventus (in defense) (the pitch is all open for Barcelona to exploit). What Barcelona did while in defense was keep Messi, Suarez and Neymar (mostly Messi) in a more attacking-position so that Barcelona could easily find a vertical or diagonal pass to one of the attacking players. Mostly, it was Messi rushing towards the opposition with great bursting speed and control. Barcelona counter-attacked with enough players to threaten the Juventus defense. Messi receives the pass and starts the counter-attack as Neymar and Suarez have already started their run vertically to drag the Juventus defense towards their own goal, which leaves plenty of space for Messi to penetrate. Now Neymar takes a forward/vertical run towards Lichtsteiner to then move more wide to open the game up for Messi who now has a 1v1 in a big space. If Neymar was to stay/keep his position centrally than he would invite Lichtsteiner in to the central area of the pitch which would leave Messi attacking through a much more compacted Juventus. This proves how well connected and clever the attackers of Barcelona really are. 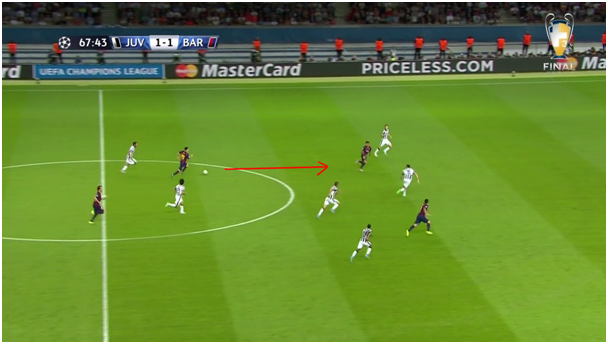 Messi dribbles past the 1v1 situation (Barzagli), which leaves Barcelona and Messi in a 4v3 situation. Messi takes a shot towards goal, which is saved by Buffon but rebounds back to Suarez who finds the net. Notice how Rakitic was the one to start the counter-attack with a through-pass to Messi and is also the one inside the penalty area to provide a passing opportunity for Messi and is ready for a possible rebound. This does lead to a goal, a goal which proves how efficient Barcelona are/hav been this season and how they can switch between different approaches from defending deep, great pressing, keeping the ball in possession and also counter-attacking opposition teams with fast & direct attacks. In this game I personally would have played a 5-3-2 Juventus formation vs Barcelona with a man-marking on Busquets with one of the strikers and a zonal-marking on Messi with one of the 3 central defenders. I would have also played with Marchisio as the right-fullback to keep balance and more variations/opportunities in the build-ups as Marchisio would have been able to keep the width as a full-back but also help in the build-ups with better passing qualities. Playing a 5-3-2 would have made it much harder for Barcelona to play through as you can keep compactness and also have the full-back leave his (as Evra did when marking/following Messi) position to put pressure on the attacker without leaving a gap behind as in these situations he would have created a 4-4-2 instead of a 3-4-3 as Juventus did in the 1st goal of the game. 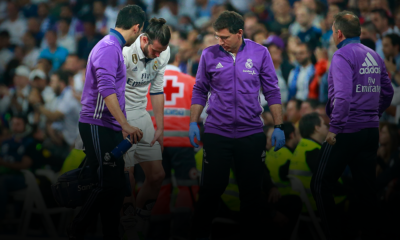 One thing that is worth mentioning is the way Barcelona are able to press the opposition. This was a great way to end the season for what may be one of the best sides ever seen. A great way for Luis Enrique to prove his worth and tactical knowledge as he has created a beast that nobody seems to be able to control except himself. Barcelona this season played and defeated the English, French, German and finally the Italian champions. We should be honored to be witnessing this fantastic era and generation of Barcelona, who is now the 1st team ever to have won the treble, twice! This evening was also the end of a beautiful generation with Pirlo and Xavi playing their last Champions League games ever as both has officially announced that they will be leaving the European stages of football to play in other continents of the world. Allegri and his Juventus also have something really fantastic going on and one feels that more is to come from Juventus and Italian football.